January was a pleasant surprise for weather and allowed us to get out and explore on a lot of days. The lake temperature is at its coldest and the fish are definitely a bit lazy at this time. Although, we have been getting fish on most outings. The large numbers of fish that we were catching back in December has decreased, but the size of fish has increased. So, it’s a nice trade off. Some of our days have seen up to 6 or 8 fish coming to the boat. 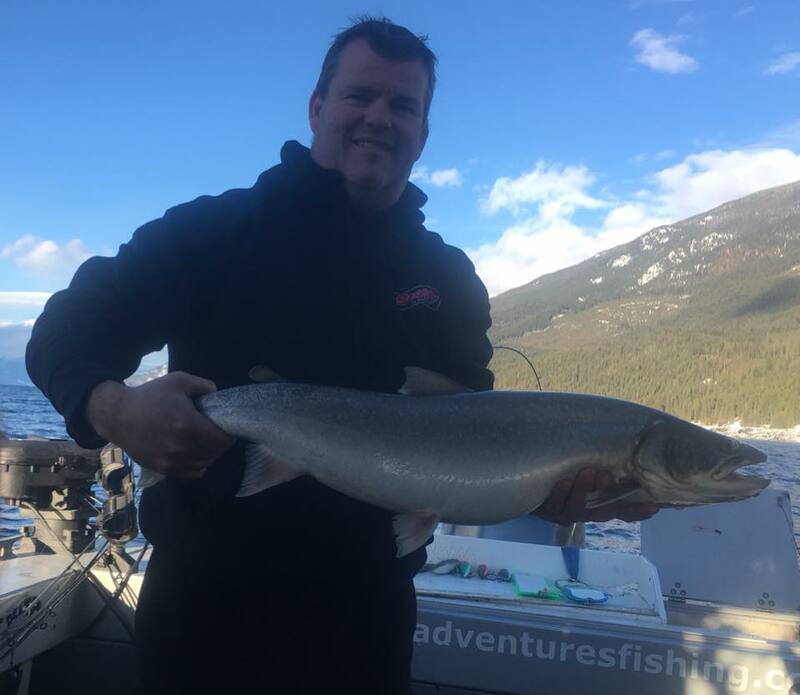 With average size of Rainbows being 2 – 3 Lbs, and Bull Trout ranging from 3 – 14 Lbs. However, due to the colder water, some of our days we have had to work hard to hook into only a couple fish. Either way, we’re still out there fishing and the scenery at this time of year is second to none. On the cold, clear days we are floating in the middle of the lake while glaring up at the snow covered mountains. Its a pretty great back yard to have. February is typically a bit slower month, although it seems to be the month when we catch our biggest fish each year. We have been also frequenting the Arrow Lakes. We spent a few days fishing the Upper Arrow during their fishing derby out of Nakusp. It was great to see a good turnout for this fundraiser. Also good to see lots of familiar faces who use to fish on Kootenay. That derby brought a lot of people to town and generated a lot of tourist dollars for just one weekend. It would be great to see that kind of life on Kootenay again. During our weekend trip, we managed to land around 10 fish ranging from 6 – 10 Lbs. Nothing to enter in the derby, but still some great quality fish. 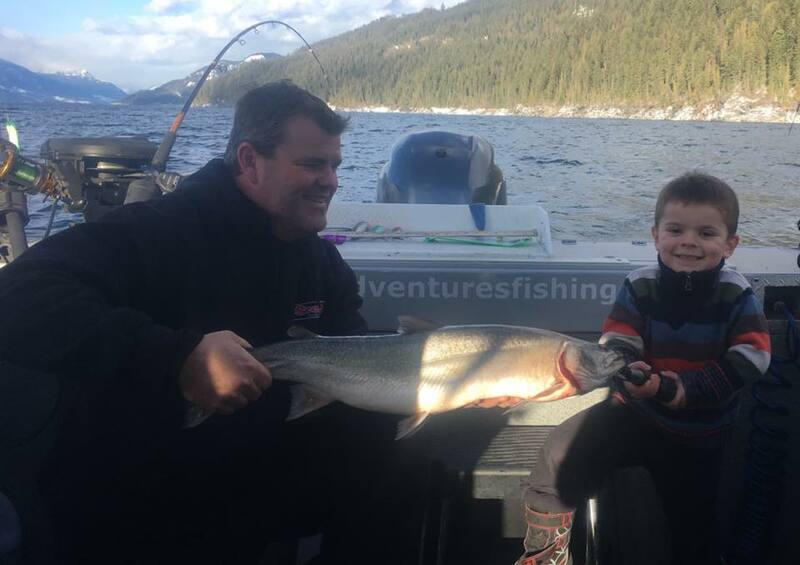 Rainbows up to 14 Lbs and Bull Trout up to 15 Lbs have been caught on the upper lake in the past couple weeks. I’ve even heard about a 27 Lb Bull Trout that was caught in early January. Trophy fishing for sure. We are also spending a bit of time on Lower Arrow this winter. The fishing has been somewhat slow, but the quality of fish has been great. 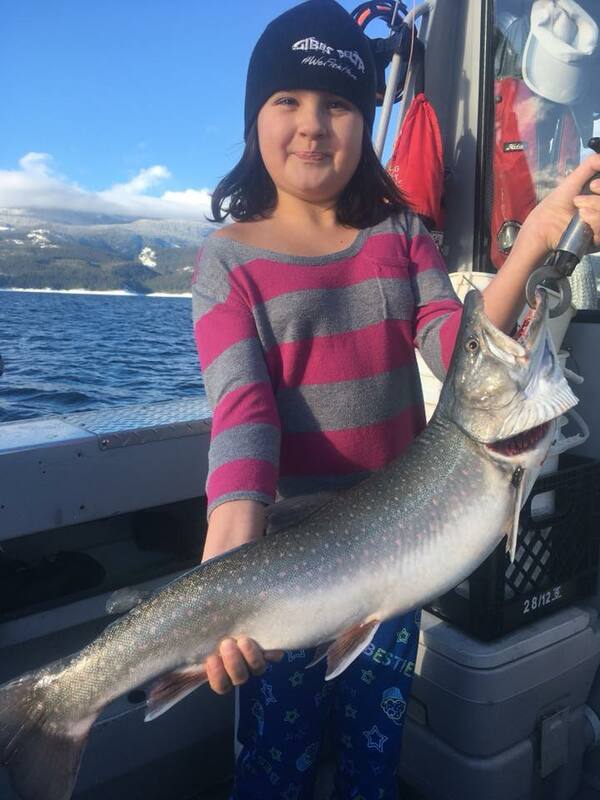 Rainbows between 2 – 8 Lbs and Bull Trout between 6 – 14 Lbs have been coming in lately. Looking forward to the Scotties Marina derby coming up next weekend. It will be nice to see everyone out there again and it will also help give a good sample of what the fishing will be like this spring. We did get out a few times on the river when the weather was mild. And as usual, the river produced some good fish. Our few days out averaged 4 – 10 fish with some good quality in the mix. 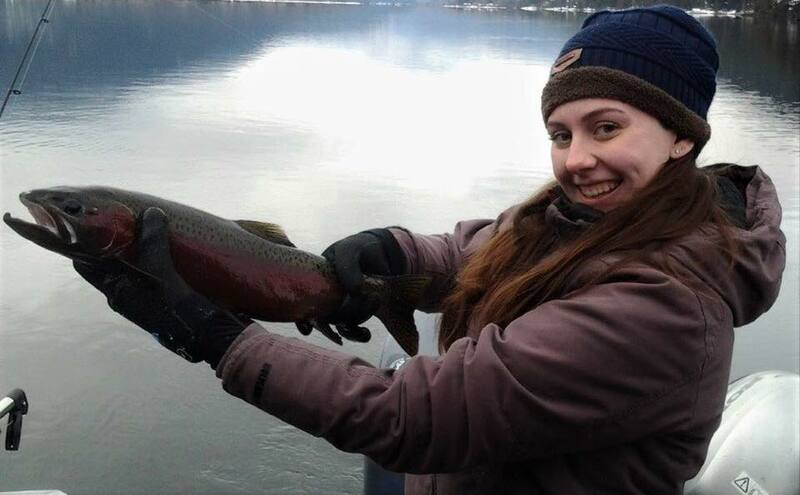 Most Rainbows were 2-3 Lbs, but we did manage to hook a beauty 6 Lb Bow on one of our trips. Still not quite warm enough to drop the boat in the water, but the shore fishing has been great. Looking forward to some milder weather after this cold snap and looking forward to getting back on the river. On the lake, it’s been a bit slower fishing, but still seems to be a mix of flies, plugs, spoons. Lately my favourite bucktails have been the black/white or grey/wht colors. Lucky numbers have been #210, 215, 216, & 228. And as far as spoons we have been running my favorite Gibbs/Delta spoons. Gold/fire stripe, or gold/fire wing have been working well. And on the riggers for Bull Trout, we have been mostly using my favorite Gibbs/Delta flasher in the lemon lime color or STS color. Paired up with my green spatter back hoochies or green pistachio, they have been a killer combo. Best depths as of late have been: 81′, 121′, and 153′. Water temp is at its coldest hanging around 37 degrees , so the fish are a bit lethargic. So, remember to slow your presentation down. And remember, fish still have to eat, so be patient. And on the River, its been the usual mix of float fishing with bait, or bottom bouncing with bait which has produced the most fish, as well as a few good fish on the fly rods using streamers. Hopefully after this cold spell, you can get out and enjoy.